Roll out and arrange pie dough with decorative edge. Place unbaked pie shell in freezer for one hour to firm. Preheat oven to 350 degrees and lower oven rack to lowest position. Brush pie crust edges lightly with egg wash. Use a piece of parchment paper to gently line pie crust. Fill with pie weights and bake for 10 minutes. Then remove pie weights and bake for another 10 minutes. If pie crust starts to bubble, press back down gently with a spoon. 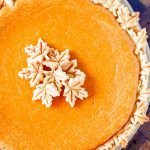 Remove pie crust and set aside. Preheat oven to 350 degrees. In the bowl of a stand mixer with paddle attachment, beat together cream cheese and pumpkin until well combined. Add sugar, salt, eggs, egg yolks and continue mixing until smooth. Add half and half, melted butter, vanilla extract and pumpkin pie spice. Add pumpkin mixture to partially baked pie crust and bake for about 50 minutes, or until set in the center. Remove from oven and let cool. I like to serve this pie chilled or at room temperature.